Provided photo Miami East-MVCTC FFA Chapter members Luke Gilliland and Jarrett Winner recently competed in the District Agricultural and Power Diagnostics Career Development Event hosted by the Preble County FFA Chapters. CASSTOWN — Luke Gilliland and Jarrett Winner recently competed in the District Agricultural and Power Diagnostics (formerly known as Tractor Trouble Shooting) Career Development Event hosted by the Preble County FFA Chapters and held at the Preble County Fairgrounds in Eaton. Gilliland and Winner are both members of the Miami East-MVCTC FFA Chapter at Miami East High School. During the contest, the team troubleshot two bugs in each of five tractors. They had to identify the problems and fix them in less than 20 minutes. Prior to the contest, they took a test over tractor maintenance and repair. Special appreciation goes to coaches and helpers for the training of the team. The lead coach was Denny Zerkle of Lost Creek Repair. The team also had a practice session with Wagner Farm Service, Koenigs Equipment in Greenville, and Apple Farm Service in Covington. The team placed first in the district out of 17 teams. They will now compete at the State Event on March 1, at the University of Northwest Ohio in Lima. 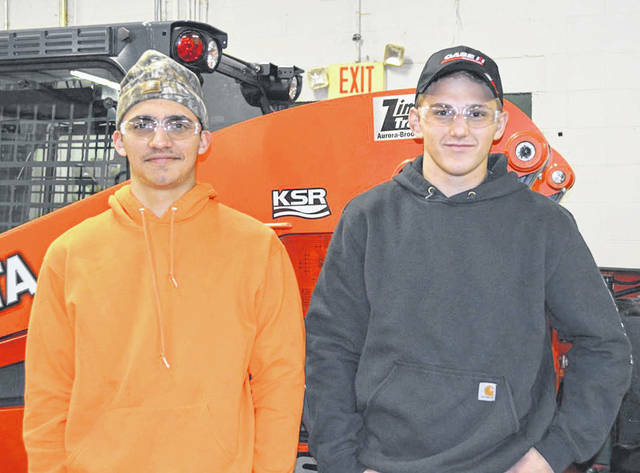 https://www.dailycall.com/wp-content/uploads/sites/30/2019/02/web1_APS-Luke-and-Jarrett.jpgProvided photo Miami East-MVCTC FFA Chapter members Luke Gilliland and Jarrett Winner recently competed in the District Agricultural and Power Diagnostics Career Development Event hosted by the Preble County FFA Chapters.